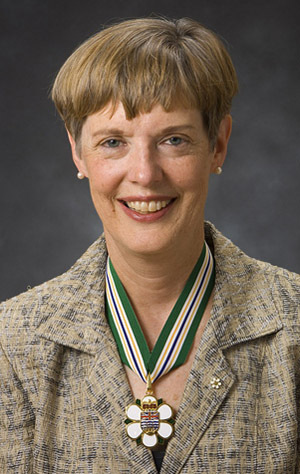 Dr. Martha Piper is the former president and vice-chancellor of the University of British Columbia, Greater Vancouver’s largest employer and an engine of learning and economic growth for British Columbians. Her contributions at UBC have played a major role in positioning our province to lead and benefit from the knowledge economy. Stimulating research across Canada, Dr. Piper drew attention to how quality research can promote economic and social development. She was a central force in developing the Canadian Foundation for Innovation and the Canada Research Chairs at UBC. Dr. Piper has consistently emphasized a focus on students and their involvement at all levels, and she is recognized for her stewardship of public and private funds, including tens of millions in donations to the university each year. Dr. Piper provided leadership in building stronger links between the university and the community, fostering innovative public-private partnerships, including the development of a new community of 14,000 people on UBC’s 1,000 acres. She promotes excellent relations with the business community by participating on Board of Trade panels, the Business Council of British Columbia, and the B.C. Progress Board. Dr. Piper contributes directly to the larger community as a United Way chair, and participates in many international organizations, such as the board of the National University of Singapore. As an innovator in university governance, Dr. Piper has substantially and creatively reorganized UBC, bringing together effective financial management, external relations, and academic excellence for the benefit of all British Columbians.